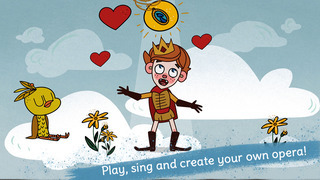 Opera Maker is a unique app suitable for 9-11 years of age that inspires children to appreciate and create their own opera. The app can be used in conjunction with creative arts, music or creative writing based subjects. Students can create their own video operas by directing, choosing the stage setting and costume characters. 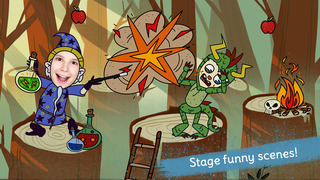 The app combines the art of storytelling by integrating classic operas such as Hansel & Gretel, The Magic Flute and William Tell. Features also include the ability to record your own voice and share your finished opera with friends. This app is available in iOS only but also in browser mode via the developers website. Opera Maker is a unique app suitable for 9-11 years of age that inspires children to appreciate and create their own opera. The age recommendations can be misleading here as we found the app was suitable for slightly younger children and adults. Upon opening the app the user is presented with a selection of stunning graphics. The app is developed by German developers and is part of the initiative “Ein Netz fur Kinder” – “A network for children”, supported by the German Federal Government Commissioner for Culture and Media. Pressing the English flag in the background will translate the apps content. At this point the user has two options: “Famous Operas” or “New Opera”. 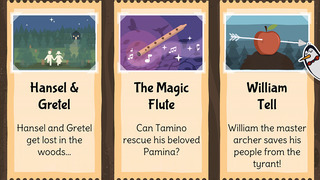 “Famous operas” introduces you to Hansel & Gretel, The Magic Flute or William Tell. Each opera is displayed as a storyboard and can be watched as a video. This gives an excellent breakdown of how the opera is staged and is very useful when directing ad thinking about your own opera. Each section can be played separately or watched from the start. The music and animation here is excellent and it gives you a real appreciation of these wonderful operas. However we did find that some of the scenes were too short and ended abruptly leaving you wanting more. The ability to be able to stop the opera at any time would be useful too. 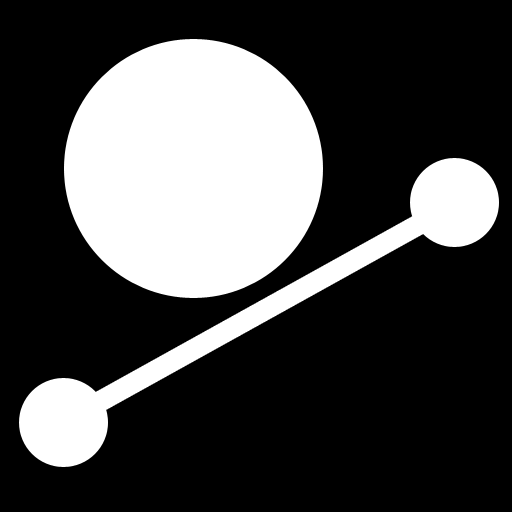 The developers may also consider a larger selection of operas or in-app purchases for further content. This app really comes into its own when a ‘New Opera’ is chosen. The app developers can be congratulated on the variety of options and features this app has to offer in this mode. The user has three scenarios for creating their opera; The kidnapping, The Threat and The Enchantment. Once a theme has been chosen the opera is displayed in a storyboard mode. We suggest starting at the beginning (casting) and working your way through the storyboard. 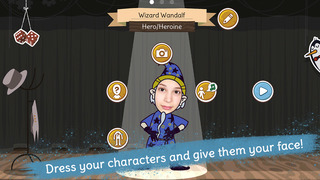 Each section enables you to choose characters, change voices and pitch, add costumes, name your characters and even add your own face. The app will need access to your photos and microphone in this mode. We love the dice icon here that will randomly choose character combinations for you. Once the casting is complete you can start creating your opera. The app offers some excellent in-app instructions via the penguin conductor. Each scene of the opera will need directing. Although this can seem quite time consuming we found this great fun. 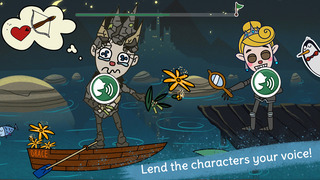 Extras features include the ability to change the backgrounds, the music, the characters face/posture, stage props and record what the characters are saying. When the storyboard reaches a scene such as an aria the same features appear but with the added bonus of being able to sing and record the characters. The user is asked to listen to the opera singer or read some lyrics to match the accompanying music. This was excellent fun and a wonderful feature that we used again and again. However we did find this very hard to master and match the lyrics or your own singing with the accompanying music. Of course this will bring out the creative side of the user and they can experiment over and over to get it just right. Once the storyboard has been completed the opera can be watched, we would like to see a feature where the opera can be watched as it is created rather than having to complete all of the storyboard to watch it at the end. Again once the video is started it cannot be stopped and the opera can still feel slightly disjointed at times. Once the opera has been created we were unsure where the opera is saved, if saved at all. Extra sharing platforms would be advantageous here like sharing via social media, drop box or email etc. The genre of opera is very often a very personal taste; you either love it or hate it. This app does an excellent job of introducing younger users to this genre in a creative and interesting way. Overall the app provides a great platform for creativity and the developers can be congratulated on its content, stunning graphics/sound and variety of in-app features. Play, sing, create and orchestrate with Opera Maker your own opera. Share the results as a video with your friends and family. You direct, choose the stage setting and the costumes. Create your very own story on the stage with ease. Take a photo of yourself and lend your face to the characters. Give them an extra special touch with your own voice. Great opera classics are available to inspire you, such as The Magic Flute, Hansel & Gretel and William Tell.